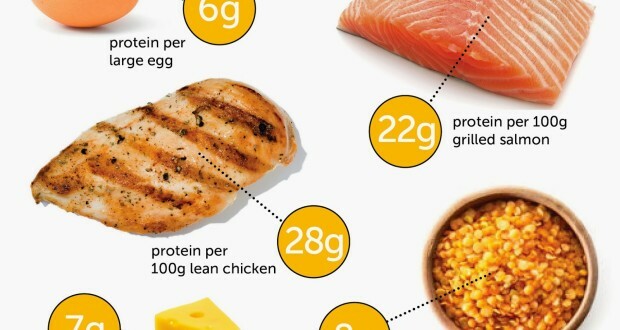 Home » Protein & Fitness » Why Is Protein Important for the Body? Proteins are compounds that consist of carbon, hydrogen, oxygen and nitrogen. They are produced on the ribosomes of a cell and made up of amino acids that are linked by a peptide bond. However, all of this is biology of anatomy and to the common person it doesn’t mean very much. To the individual passerby a protein is understand by the food sources that represent it such as meats, eggs, dairy, seeds, nuts, and legumes. Most people know that protein is a necessary part of their diet and some people even know that it helps in building muscle. But most people have no idea how important protein is to the body. Protein is such a vital part of the body not only as a food source but also as part of its structure and function. Proteins make up about 15% of a normal lean body mass. This is due to the fact that most of the body is made out of proteins such as muscle, cartilage, ligaments, tendons, bone, skin, hair and nails. This makes up the structure of the body. Additionally, hemoglobin, hormones, antibodies and enzymes are also proteins of smaller capacity. Because of its large presence within the body it’s impossible not to see the significance of protein to our functioning. Proteins have six different functional roles that they play within the body and throughout our cells. They are structural, regulatory, contractile, immunological, transportation, and catalytic. Structurally protein makes up the framework of the body through muscles, bone, ligaments, tendons, hair, skin and nails. Proteins regulate the physiological processes within the body including growth, development and metabolism. Neurotransmitters are proteins that mediate responses and sensations of the nervous system. Hormones are proteins, such as insulin, which regulates the levels of glucose in the blood. Proteins within the muscles control muscle contractions to produce movement of the body. Myosin and actin are the two primary muscle fibers made of protein that shorten and elongate a muscle. Proteins protect the body from foreign substances, and invading microbes. Antibodies and interleukins are two proteins that defend against the invasion of pathogens. Protein transports essential substances throughout the body. Hemoglobin transports oxygen to the bloodstream. Proteins regulate biochemical reactions such as digestion. Salivary amylase, sucrase and ATPase are three enzymes that speed up chemical reactions within the body. Proteins are made up of amino acids, which are critical in the functioning of our metabolism. There are 20 different amino acids of which 10 are essential amino acids. This means that they cannot be made within the body or are not made in sufficient amounts and therefore need to be obtained through our diet. With all 20 amino acids the body can produce all the proteins necessary for proper functioning. If there is a deficiency of protein within the body, which can occur more frequently in vegetarians, the symptoms can be easily recognizable. Fatigue, weakness, decreased muscle mass, inability to recover from injury and ones hair falling out are all symptoms of protein deficiency. In the American diet most people consume enough protein or more than enough protein in their daily diet. It is important to know that the protein within the body is constantly being broken down and replaced in every cell, tissue, and organ therefore making sure you are consuming high quality proteins is vital. Complete proteins such as meat, poultry, fish, milk, eggs and cheese contain all the essential amino acids and are consequently high quality proteins. Incomplete proteins are missing one or more essential amino acids and should be consumed in combination with complementary proteins. Examples of two incomplete proteins that complement each other are rice and beans. The recommended daily amount of calories that should come from protein is 35%. This usually is higher for athletes, body builders and people whom workout a lot. This is due to the fact that their bodies have to sustain more muscle mass than the normal person. To figure out how much protein you should consume daily multiply your weight in pounds by 0.4. This will give you your weight in kilograms. It is recommended to consume 0.8 grams of protein for every kilogram of body weight. Multiply your body weight in kilograms by 0.8 and you will have the number of grams of protein you should consumer per day.